"There are two separate chassis - one for 27.5'' wheels and another for 29'' wheels - and the former can fit a tire up to 2.6'' wide, while the latter can take a 2.6'' wide 29er tire or a 3.0'' wide 27.5 plus-sized wheel and tire combo." Glad you're excited about the Ribbon! I can't wait until it arrives. Yes, those tire specs are correct. I'm about to mount 29x2.6 Schwalbes on my ride with a 29" 160mm Ribbon. This level of CS is why I want this fork and like this company, I've spend 30+ minutes on hold with RockShox for one question. So Noah, your running the 29" ribbon at 160mm, the old press release states that the 29" fork maxes out at 150mm. Did I miss somthing (which is probably the case)? Yes, we are now planning to release a 160mm, 27.5+ / 29" Ribbon. Sweet, now if I can find the money to complete the rest of my build. Thanks again Noah for the help and fast repsone, I greatly appreciate it. When is this fork going to hit the market? How does it ride compared to the stage? Heck no! I love that MRP puts function ahead of appearance. That reverse arch will be nice during our 6 months of rain in the PNW. I don't know...aesthetics have to be part of the equation as well. 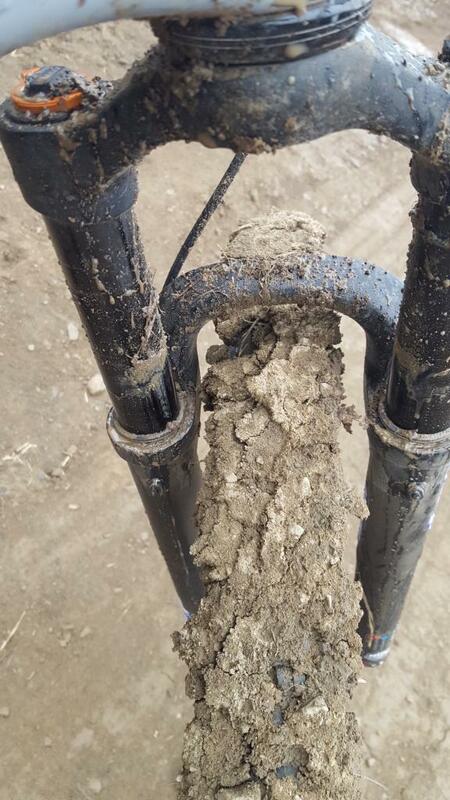 I'm a PNW rider & have never really found mud collecting there to be much of an issue when it comes down to it. With the new crop of small super effective fenders it's really a moot point. If there really was a form over function issue here it would be mud/debris collecting at the tight spot/crevice against the seal where the arch joins the stantion which remains unchanged. Seems like kind of an ugly unpolished solution to a non-problem that will enevitably collect dirt anyway, but instead of being hiddin will now be front and center. With all that said I wouldn't have bothered to right that out if I weren't completely board right now. I'm sure it's a rad fork and I will own one. As a whole MRP is great company I'm stoked to support and have found my stage along with MRP's customer service to be stellar. The reverse arch is an interesting business decision. I have never heard anybody in my riding circle complain about dirt accumulating behind the arch, and I'm in the PNW. I could see more people not purchasing the fork due to appearances than people making the purchase due to this feature. If performance and durability are greater than other fork options, I could see myself looking past it though. Oh good! 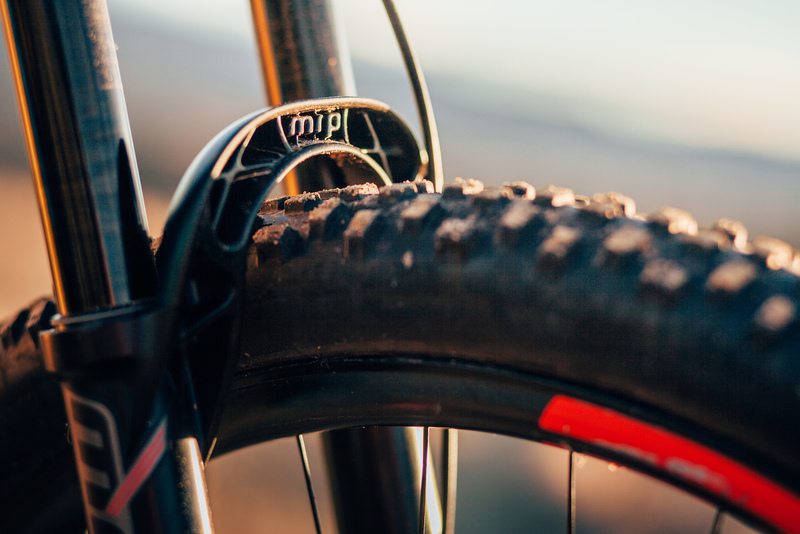 MRP let it slip that there will be a 160 29r fork! Now we can start talking about it! HOORAY! If the Ribbon represents improvements to the Stage fork (which it does) it will probably be the best fork out there. People will see benefits from Ramp Control on their RS and Fox product, read up on the drama dealing with Fox and the poor damper adjustments on the Charger and head straight to MRP! Keep up the great work MRP! Production starts in March. That doesn't mean we're receive a shipping container of forks in March, it means we start producing these babies one by one here in Grand Junction. Regarding the forward-facing pocketing (I hate the term reverse arch, sounds like it refers to a Manitou), there were practical and aesthetic reasons for that decision. I'm looking at a Ribbon right now and I think it looks boss, but I understand people have different tastes and opinions. 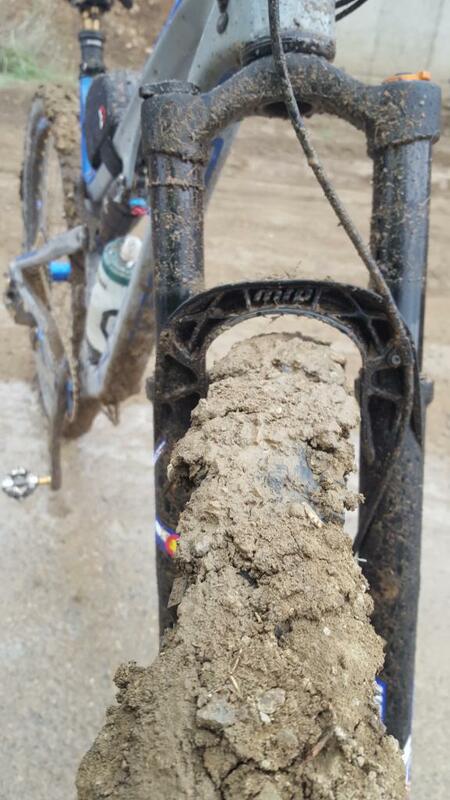 Not only does it provide the "anti-mud" benefit, it also gives us a unique look in a sea of all black forks. It also made us spend A LOT of time making that area of the fork look finished AND be weight-efficient as possible, which I believe helped us achieve the awesome overall weight of the fork. I doubt many designers spend much time optimizing the hidden pockets found on a traditional lower leg casting. They're Speed Pockets (TM). Looking forward to putting a Ribbon on a Banshee Prime! Where's the best place for info/spec?? We'll have a product page up once we get closer to launch. For now there are quite a few stories on the fork from the tradeshow season. I don't recall axle-to-crown off-hand, but it's in-line with the competition. I wanna say 562mm for 29" 150mm? Of course you can lower it from 160mm, it's internally adjustable from 120-160mm with spacers (included). We even include 5mm spacers in case you want a 135mm or 155mm fork. Any chance there will be a 180mm 27.5 fork? Nope. The 27.5" only goes to 170mm. We even include 5mm spacers in case you want a 135mm or 155mm fork. Maybe good old Canfield Bros will let us run this 160mm for on the front of our Riots since it will only be a touch longer then the pike 140. If so, sign me up for a new fork. Sorry if I was unclear. The axle-to-crown height for the 29" Ribbon is the same as the Pike at the same travel. So a 160mm Ribbon will be 20mm taller than a 140mm Pike. I will double check with engineering, but the last info I have calls out a 561mm a2c for the 150mm Ribbon. (thus 551mm @ 140mm and 571mm @ 160mm). Noah, I'm considering a stage (I don't need the boost compatibility that the ribbon provides) but have a couple questions relating to the improvements in the ribbon that I've heard might make it to the stage. Basically, improved air spring, pssst valves, & tooled axles. Are any/all of these making their way to the stage? The Stage has already received the spring and damper updates found in the Ribbon. However, it won't be getting PSST valves or tooled axle options as those would require casting changes. The new stage as the independent negative spring circuit? Yessir. Just realized the website is not updated, I'll do that! Guess I'll have to consider going ribbon then... I do have a hope hub, so guess going boost isn't too big a deal... I just don't love mixing boost/non-boost on one bike, just for OCD reasons. I have a 2015 Stage, is it possible to update any of the internals to reflect the latest technology offered by MRP? I just don't love mixing boost/non-boost on one bike, just for OCD reasons. I'm using a non-Boost DT front hub with our Better Boost Adapters on my Switchblade that has SuperBoost Plus™ - how does that make your OCD feel? Haha. It's at least boost front & rear, just a more different rear boost! Where it really gets me is companies selling a boost frame with a 15x100mm fork, or vice versa, it's like, "way to screw your customer out of ever buying an off the shelf wheelset." So - if the Ribbon is an update of the Stage - which i've owned on previous bike (and yes - it was better than the Pike it replaced and any previous gen Fox) - i believe this should and will be the upgrade on the new bike - can't wait for the release and more info to flow! Gotta love made in the USA by a bunch a passionate riders!! Keep up the great work and innovation!! Cheers! Thanks! Wishing I was out riding my Ribbon right now, dang rain! Was going to order a Fox 34 Fit 4 for my 27.5+ build. That way i can run 27.5x2.8 or 29 x 3.0 with 120 mm of travel. Will the MRP boost offer 120 for these tire sizes? No. You can use the 29'er version at 120mm of travel and use the 2.8" 27.5 tire in it, but it tops out at 2.6" for 29'er tires. I don't believe Fox says that a 29x3.0 will fit in their fork and, likewise, we don't either. 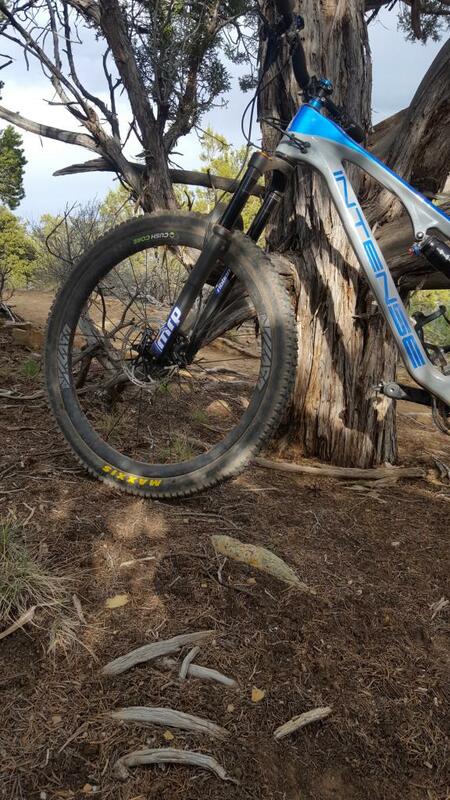 However, what tire you can squeeze in any fork is up to many factors: true size, rim width, and acceptable/appropriate clearance. I can tell you I have a Schwalbe 29x2.6 NN in my Ribbon 29 and it has a ton of clearance. Are you going to run a 27.5x2.8 and 29x3.0 in the same bike? Seems like a big wheelsize discrepancy. Any updates on availability, Noah? Anyone get a chance to ride it at the Sedona MTB Fest? Reverse arch doesn't look bad after all. No lie. At first I didn't like it, but it didn't take me long to get to the point where I think it's the best looking fork on the market. Looks good. Can't wait to see how it rides! I love the Colorado decals but haven't seen them as an option on the website. Anyway to get those? Cool!, keep us posted. You putting that on a wreck? Think I remember you over in that forum. Going on the Primer at 140 travel to start. Thinking about over-forking the Wrecker, I think they'll compliment each other well. CO stickers recommended by MRP. Called them up and ordered direct, thanks MRP! Thanks, and sure, they're a standard option. I'll add them to the website. MRP should design a fender with a male waffle pattern on a tab that snaps into the arch. Is there a axle to crown spec sheet on these out there yet? Or anything that snaps in. Maybe a piece that snaps in which you could attach nothing, half, or full fender. Axle-to-crown: 562mm for 170mm 27.5", 572mm for 160mm 27.5+29"
Last edited by NoahColorado; 03-29-2017 at 10:27 AM. any chance for a Dirt Wizard 29x3.0 to fit in this fork? any picture of the fork with a wheel in? Haven't tried a Dirt Wizard. And we didn't design it for 29+. That said, here is my fork with a Nobby Nic 29x2.6 on a ~30 ID rim. Heaps of room. That would be amazing considering the weight. In the Facebook live Q&A it was mentioned that the Shockwiz would not play well with the Ramp Control. I assume this would be the case if you are continually adjusting it for trail conditions? If I found the sweet spot in the Ramp Control for my trails, the Shockwiz would work? Ribbon replacing the Stage on this bike, ridden mainly Pike(stock and custom) and Fox 34 or 36 before trying the MRP forks. The Stage was new enough that it had the Ribbon internals(Dual air and IFP damper) allowing a glimpse of the future. Having the Stage dialed made the decision easier when I started looking for a boost fork. The Ribbon is bigger, boostier, burlier, more refined ...and... lighter? Sounds good. Despite the burlier look side by side with the Stage(or Pike), the Ribbon has a very sculpted and refined appearance. Recommended set-up is the same for the Ribbon and Stage so I moved the settings over. I did start with a little lower air pressure, assuming the air chamber is a little larger with the 35mm stanchions , and new seals. Ride has been very supple yet the Ribbon seems to ride a little higher than the Stage. Initial impression is that it's stiffer/tracks better pushing it through rocky, rooty corners. Only about 30 miles so far in a couple of rides but really like it on this bike. Hope to open it up on some bigger trails soon and tweak the settings. Lots of room for some big rubber, along with plenty of mud clearance if you get caught out. OutCast Arch looks to work as designed. Haven't had a big Psst! yet, but I like leaving the zip ties for cable management. So far liking the MRP approach, style, design and the great customer support! Currently looking for new 29 160mm boost which is going to replace Pike. Can You share some info how it compare when speaking of culture of work and small bump sensitivity? Howdy. The Shockwiz will not work with MRP forks or forks with Ramp Control cartridges, full stop. The Ramp Control mechanism is effectively using air as the damping medium. Since the schrader valve leads to the "Ramp Controlled" section of the air spring and the Shockwiz measures changes in air pressure through the valve, it will be unable to decipher any meaningful data in use. Basically, Ramp Control gives you different compression ratios at different stroke speeds. At low stroke speeds, the feature is effectively invisible: air compressed at a slow rate goes right into the chamber unfettered. At high shaft speeds (and Ramp Control turned up) air cannot get into the Ramp Controlled section of the airspring quick enough, so you have a similar effect to volume reduced air spring: the effective spring rate ramps heavily. As an example, say there are 20 of us in a small room with one exit. If we all get up and leave, one by one, theres not bottleneck at the door (a slow-speed compression event). However, if we all get up at the same time and try to rush out, we'll get stuck in the door (a high-speed compression event). This is exactly what happens in the event of a "spike" to oil in in a damper. The speed of the compression event overwhelms the damping circuit and so much oil is trying to pass through that it jams (oil is not compressible). But the beauty of using air as the damping medium is that it can be almost infinitely compressed, so it can never truly spike. So the pressure in the Ramp Controlled section of the air spring actually may not change dramatically in a high speed hit (especially with a heavy amount of Ramp Control added). A Shockwiz would see this and interpret this a small bump, or maybe no bump at all. In a nutshell, it don't work. There are other ways to get telemetry without a shockwiz or expensive pro setup: haven't had a chance to try it yet, but Andrextr shows a method in one of his YouTube videos that only requires a go pro & a free piece of software called kinovea. Recommended set-up is the same for the Ribbon and Stage so I moved the settings over. I did start with a little lower air pressure, assuming the air chamber is a little larger with the 35mm stanchions ! Awesome! Thanks for sharing your impressions! That's correct that the Ribbon will take slightly lower pressure than the Stage. We're finding most people like ~40%(in PSI) of bodyweight (in lbs.). This is not yet reflected in the quick setup card, but it is in the Owner's Manual. As well, longer-travel models require less air than shorter-travel models. I ride both a 160mm Ribbon and a 135mm model (both 29"). I'm 175lbs and am liking 70 psi. pos. / 80 psi. neg. in my 160mm fork. And in my 135mm fork, 81 psi. pos. / 86 psi. neg. I like the higher relative pressure difference in the long-travel fork because I want all the suppleness I can get on a slack enduro bike (but an appropriate amount of Ramp too), whereas I like the slightly tauter initial stroke on my shorter-travel XC rig (and a ton of Ramp, because without it my big-a** would be using all 135mm of travel quickly, since I tend to ride my XC bike like a much bigger bike). You gotta include clicks of ramp control with this, otherwise it's hard to gauge. There are 16 clicks in the range. I'm usually at 6-8 on the enduro bike and 12 or so on the XC whip (counting from full-open). More than that on the XC bike (especially on rougher courses) adds to fatigue on longer rides. I might add more on a particular trail or a shorter segment to deal with specific hits/features I know about. But in something like an endurance race, leaving the last little bit of available travel on the table over and over again wears you down. Currently running the Ribbon at 140 but wouldn't hesitate to run it at 160, very solid fork. Small bump sensitivity is the best I've ridden on a new fork. Lower stiction and breakaway force than the Stage and its great that the negative spring can be set 5-10% above the main air spring pressure. The Ribbon has been very impressive so far. I appreciate the insight on fork set-up, very helpful. I'm running closer to %50 (PSI to lbs) but at 140 travel and it's very supple. Don't know if thats better seals, fit and finish, or if it might have a touch larger negative chamber? It feels like the slightly higher pressure may give more mid-support and doesn't hurt small bump since I can run the negative PSI up to %110. I like being able to adjust the Ramp according to the trails as well. I'm certainly no expert, but I like attempting to understand the whys and wherefores of the fork design to optimize the set-up. Definitely a fork with a big sweet spot where the tradeoffs in settings don't compromise performance. Very easy to use and fun to fiddle with. If people are sharing settings could we include where the rebound is with these as well. I'd love a few baseline tunes to try when I get mine next week. I'll post up some settings up after a few more rides. Fork is still breaking in(pretty amazing OOTB) and doing some bracketing on bigger stuff before I'll consider it dialed. besides direct from MRP - any LBS in front range stocking/selling? or online vendors where an active junky rebate kicks in? or online vendors where an active junky rebate kicks in? Soon. We don't have any available just yet, but soon. Providing unrivaled support and unbeatable pricing on all cycling goods to riders near and far. Seems that while jenson has them listed, they aren't in stock. They quote a 4-6 week lead time. 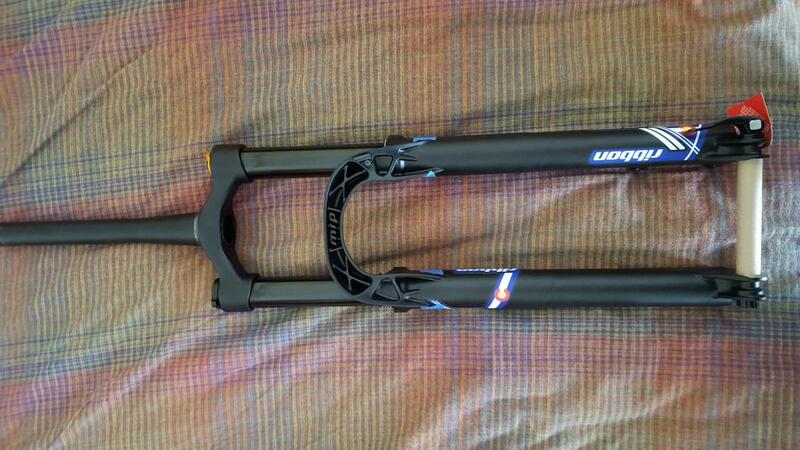 Looks like they have (2) 27.5" forks and (1) 27.5+ / 29" in stock. These forks are easily convertible travel-wise. You're only out of luck if you want a 160mm 27.5+ / 29" - because the shorter-travel models can't be up-traveled all the way to 160mm. Last edited by NoahColorado; 04-06-2017 at 04:03 PM. Looks like they have (2) 27.5" forks and (1) 27.5+ / 29" in stock. These forks are easily convertible travel-wise. You're only out of luck if you want a 160mm 27.5+ / 29" - because the shorter-travel models can't by up-traveled to 160mm. My bad, I just spot checked one configuration of each model. I'm interested in the 29er in 150mm. Any idea the A2C of this configuration? because the shorter-travel models can't by up-traveled to 160mm. Noah - can you clarify this? Or is there some overlap between models? I recall some of the older MRP forks had a travel range - like a "short model" that was adjustable anywhere from 100 - 130 and a "long model" that could go say 120-150. Or something like that. As you can see, the 160mm model is slightly different and the others can't take their travel up to 160mm. The 160mm requires a longer damper tube and uses a higher volume of oil. Models ordered at 140 and 150mm will then feature the longer damper tube and be able to go as long as 160mm. When we make this change we will add some sort of additional digit or letter to the serial numbers or some other indicator to signify whether the fork has a long or short-travel damper. It should be noted that you can space the forks down further than the described ranges, however you'll need to purchase or procure additional travel spacers (only 35mm worth are included with the forks). So - decided to keep it local VS going online to get a nominal discount. This thread and others for the Stage and other MRP products show the commitment and service MRP have to their brand - but more important the customer. Lots of good stuff out there but if the Ribbon is indeed a beefed up and even better Stage (which i ran for over a year and loved!) than no need to look any further frankly! Should be awesome on my Colorado Spot Rollik!! And a question for MRP - do you have instructions posted for changing the fork travel? Cool. I'm actually shooting a tech video on this tomorrow. It should be edited and up early next week. Would still like to know where this fork sits in the burliness spectrum.. I've got a Knolly Warden with 160mm Pike and with me being over 200lbs it really is crying out for a Lyrik or similar. Dropped it to just under 70 positive and 78ish negative. 11 clicks from closed rebound, 6 clicks ramp. I didn't get that really supple off the top feel, and overall pretty firm, yet overall really really solid and stout feeling and frankly nothing bad on the trail - just a bit more firm than i like - will simply need to keep working towards my desired feel for this fork. I probably used btw 2/3- 3/4 of the travel - closer to 2/3. I backed ramp off to 4 but believe i need to get my pressures set. Not sure i was even close to btw 15-20% sag. I'll try the tip from Noah previously regarding riders liking the ~40% riding weight for pos (64ish psi for me) and close to 75 neg... If anyone reading this thinks thats off let me know. Check out this chart I'm using for setting up forks at demo events. I'm still tweaking it here and there, but it's coming together and pretty solid as-is. Pretty bang-on with that chart. Running 140mm on the trail 29er. #180 rider. PSI #80+, #88-. Rebound 9-10 out, ramp 7-11 depending on trail, first third of the LSC depending on trail. Fork is running great. Walks through chunder pedaling, great pushing through Corners, haven't had a hard bottom out yet even as the bigger trails are opening up. Best stock fork I've had so far, can't honestly think what a custom tune would fix at this point. THANKS - nice to see my calculator nailed it at 64psi based on a previous post - i was a little wary to go there tho - now - everything has been re-adjusted - just need to ride, but around the hood it felt better!! Thanks again! Definitely closer to the 36 than the 34 for the stiffness and burly factor. Also seems a step up from the Pike, though the Pike was not Boost. Really reminds me of the 36 for tracking through rocky/rooty corners at speed. Haven't been on the 36 for a couple of years and that was 160 travel to 140 currently on the Ribbon. Have been on the Fox 34 with the E16 damper tune and prefer the Ribbon for both spring curve and damper. Just ordered one for my upcoming Phantom build. Stoked to give it a whirl. 2nd ride in - same trail loop. new settings are better than first ride. This fork is stiffer and more capable and controlled than the F34(grip damper) it replaced. It is easy to get the really supple small bump without going to say a 25 - 30% sag (like i had to on F34) also - it rides higher in the travel and feels more controlled as speed, bump frequency and bump size increased... Really composed. As it is - even off the biggest of hits last night - fork felt better overall yet still left at least 2 inches of un-used travel so I suspect I may back ramp off one more click or play w air pressures even a little bit more. As a side note - my Spot Rollik came spec'd w 150mm travel so growing this a bit to 160mm should result in silghtly slacker head angle (apprx 66.6) and slightly longer wb. the bike really feels composed on the DH wi no adverse effects to climbing (no additional wheel wander or rider adjustments necessary) and still just as nimble to get up or down the tightest switch backs. Cant wait to gain a few more rides and really get this dialed in!! These settings definitely an overall improvement for me and my riding. Really appreciate the support you guys offer. I still feel like i can or should be getting "more" as my last ride, on some fast DH w jumpy features and deep compressions - and I still have 2 full inches of stanchion untouched. I don't feel I need to be bottoming out - but feel i'd like to know I'm using all of it! or is that simply forum conditioning? Settings are (depending on shock gauge accuracy) should be within a 1-2 psi of the card you posted. Rebound started at 13 but closed 1 to 12. Ramp is at 3 from start or least progressive. Would air pressure to pos or neg alter this? OR - is it Ramp? Overall - i really like the way the fork feels - better than the highly regarded 2017 Fox 34 it replaces. It is burly/stiff and does nothing strange. Composed and smooth! I like how effective the mid stroke is - not just passing through - and I've only seen top out a few times. Usually 10-15mm reserve, so less than you're seeing. Last edited by TheCanary; 04-17-2017 at 10:26 AM. This fork is stiffer and more capable and controlled .... it rides higher in the travel and feels more controlled as speed, bump frequency and bump size increased... Really composed. This is pretty much exactly what I thought when I got my Stage a few years ago. Also pretty much sums up why I haven't been interested in another fork since then. Except maybe a Ribbon someday. Is there any info out there regarding regarding the process to change the travel on the fork? I've looked in the MRP website but didn't find anything. Printed instructions are included with all forks. No I'm just curious. Im considering this fork for a new build and I may need to adjust the travel. Wanted to get a feel if I needed a PHD to get it done. Looking forward for the video. It's easier than most, but you'll still need to drop the lowers and re-up the bath oil. 10mm socket, internal snap ring pliers...hammer. I think that's it. Cool. I'm confident in saying it's the easiest travel change procedure of any fork on the market. You'll see once we get the video up. Please tell me more about the ramp control for the 36, I have an Avalanche cartridge and its VERY progressive in the last part of the travel, how much more linear can i make the spring rate with your system ? Also, when will UK distributors be getting them ? Noah/Dirt, Thanks for the info. I'm looking forward for the video. I saw a two year old video for the Stage and it didn't look too bad. Anyone up to shuttle the ribbon Wed?